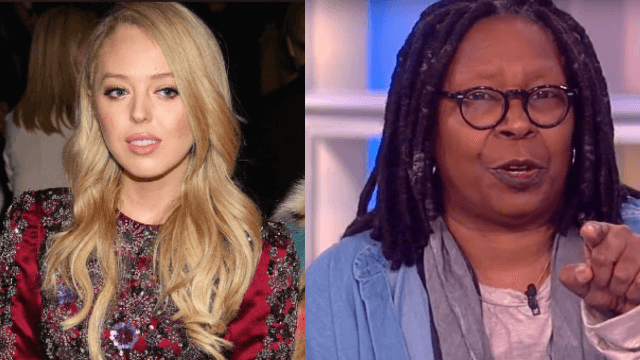 Tiffany Trump has found a friend in Whoopi Goldberg, at least during New York Fashion Week. News coming out of New York Fashion Week is that Tiffany Trump is being as neglected by the fashionistas as she is by her father. At designer Philipp Plein's show on Monday, Wall Street Journal reported that the sad, forgotten First Daughter (forgotten by her dad) was fully Mean Girls-ed out. But Tiffany was defended by an unlikely source: Whoopi Goldberg. Wednesday morning on The View, Goldberg, who is an unspoken critic of The Donald, and even feuded the second-least favorite, Eric, spoke up for the "Like a Bird" singer. Tiffany was grateful for the defense, and is excited to make a new friend. It's sad that Donald Trump—who so famously tweeted that his daughter Ivanka "has been treated so unfairly by Nordstrom"—couldn't take the time out of his busy day of tweeting and watching cable news to abuse the power of his office and say "my daughter Tiffany has been treated so unfairly by New York Fashion Week." Lucky for Tiffany, there's Whoopi to the rescue.